Synopsis: For centuries it has been locked away Lost beneath the sea Warded from earth, air, water, fire, spirits, thought and sight.But now magic is rising to the world once more.And a boy called Gavin, who thinks only that he is a city kid with parents who hate him, and knows only that he sees things no one else will believe, is boarding a train, alone, to Cornwall.No one will be there to meet him. The ocean has kept its secret for a long time, but now it is giving it up to the earth. It will be found- the magic ring of the greatest magus in the world- and it will be at the centre of a power struggle. Gavin never knew he was different until everyone started telling him that it wasn’t normal to hear voices. Miss Grey, he called her, and she became his secret. The only person who ever understood him was Gwen; his odd aunt. Now Gavin is visiting her in Cornwall, and in the process he will discover who he really is. He will discover hidden magic. Beautiful, isn’t it? All the more so when Treadwell takes up that poetic beauty into his prose and weaves it into his narrative and dialogue until it permeates every sentence and every paragraph. Every line is beautifully crafted and rich with imagery that it almost feels like it is an authentic legend rather than an amalgamation of Greek, German, Arthurian and Celtic tales. The glorious language is particularly impactful in the chapters set in the 1500s following the magus Doctor Faust and less so in a modern-day setting, but even so: Advent is vivid and full of a newfound joy for language that may put some readers off but reward those who delight in words, which is to say: don’t expect a fast-paced thriller but a delicious tale of forgotten magic, magi and intrigue. The essence of Advent is that of forgotten magic. Treadwell takes up Doctor Faust, of the German legend, and has him the world’s greatest magus who falls in love with Cassandra, a spirit woman of Homer’s Iliad who is cursed to prophesy. The story unravels from there- weaving its way through Gavin’s story which takes elements of the Arthurian legend until they become intermingled and one. The first half of Advent is relatively mundane and domestic, but once it really gets cracking it transforms into a wonderful tale of self-discovery set against the oddly contrasting and yet satisfyingly wholesome legends. Reading Advent first had me come to the conclusion that it reminded me of both Jonathan Stoud’s Bartimeaus Trilogy and Ransom Riggs’ Miss Peregrine’s Home for Peculiar Children. Faust’s story, which unfolds in reverse, is very similar in style to the gothic magics in Bartimeaus, whilst the contemporary side of Advent, Gavin’s story, mirrors more the mystery of Miss Peregrine’s Home as both have a stately home with goings-on that are unusual, to say the least. However, this comparison soon falls away as Advent mergess the two narratives into one which is neither-nor, but wholly unique and invigorating in its own sense. Treadwell does well to hit the right level of domesticity as well as alienation with Gavin and his “imaginary friend” Miss Grey. Advent, as well as being a great fantasy story, is a tale of Gavin’s self discovery – he’s always felt out of place in London with his parents- and I’m pleased to say he is relatable whilst also not being completely normal (which is essential for his character). The vast majority of Treadwell’s other characters serve purely the plot, but the few whose perspectives he does dip into all have trials and tribulations of their own. Advent may be classed as a “young adult” novel, but there is little reason to suggest that older adults won’t enjoy it -if not more so than a younger readership. Unravelling Advent‘s story requires patience: but to all who wait, much is given, and the reward of seeing things come together is more than enough. 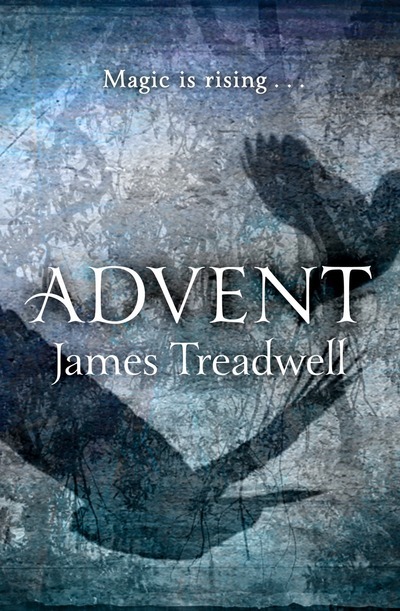 Treadwell displays a sophistication and understanding in Advent, one that is rarely seen in YA novels, and one, I hope, makes Advent stand out from the crowd of commercial fiction. What did you think about Advent?